Pregnancy and Yoga — Amy Chitwood Burslem, LAc. Taking an exercise class while you are pregnant may be one of the furthest things from your mind. Naps, rest, and food often seem much more appealing! However, it's very important, especially during pregnancy, that you become more in tune with your body and work on flexibility, and work on strengthening both your mind and especially your body. Yoga offers both of these in a low impact, relaxing environment that encourages you to exercise your body as well as focus on the life that is growing within you. It's a very special time, and very important you take care of yourself! 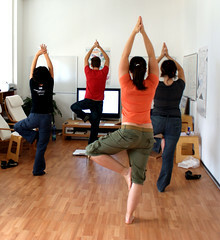 Prenatal yoga classes teach you how to open the pelvis and develop a deeper sense of concentration. Many active birth classes are based yoga techniques, and different positions for labor and delivery are taught to both the mother and birth partner. Breathing techniques learned in yoga will help during labor, as well as learning to hold one position longer than a few seconds (which you will need during longer contractions). Learning poses to ease the lower back pain and stretch out the round ligament pain (the stretching you feel in the lower abdomen) is very helpful in the first, second, and third trimesters. Yoga exercises will lead to improved physical coordination, increased confidence in yourself and your body, and a sense of inner balance. These tools will be vital during labor and delivery, as well as the ability to breathe into contractions, and relaxing when you have the opportunity. Prenatal yoga classes are also a good way to meet other pregnant women who are in the same stage as you are, just starting out, or even close to their due date. Yoga classes offer a great way to discuss what's been happening in your pregnancy with women who understand, and will help you through the next few months. There is something very stretch out aching backs and calves, and a time to meditate on the life growing within you. The sense of community that you feel in the classes may be difficult to find in other aspects of your life at this time. Call around your local yoga shops, and keep in mind that it's best to bring your own mat- most yoga studios have some to lend out, but having your own is nice. If you aren't having any luck finding a prenatal yoga class in your area, there a lot of CD's available to pregnant mamas that will walk you through the poses. CAUTION: There are yoga poses that should be avoided during pregnancy, so be sure to check with your practitioner and only practice prenatal yoga poses. The Health and Yoga site shows women poses for each trimester with pics and an explanation of how to do each pose, along with the benefits of each one. Or you can check outThe book Yoga for Pregnancy by Judith Lasater, PhD, is a good beginning book for those of us who are new to yoga. There are simple explanations, and a few poses to get you started. Preparing for Birth with Yoga by Janet Balaskas is another highly recommended book, and there are explanations of each pose, and meditations to help with labor, and even techniques to use during delivery.